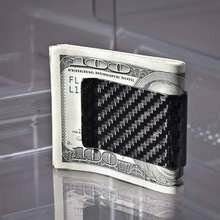 With this premium quality carbon fiber business card case you can carry your business cards (and credit cards) with style. The photo truly only shows part of the unique look that this carbon fiber case possesses. With this premium quality carbon fiber business card case you can carry your business cards (and credit cards) with style. The photo truly only shows part of the unique look that this carbon fiber case possesses. As you tilt the case in the light, the fibers in the carbon fiber yarn show a unique 3D depth, which is only present with real carbon fiber. The top cover has the carbon fiber features and the case body is a polished and plated steel. Capacity is approximately 20 business cards or 6 credits cards. You can also use this instead of a money clip and put both bills and credit cards in the secure case. Simply put in your front pocket and you are good to go! - The absolute biggest business card this case can hold is 3.5in x 2.17in (89mm x 55mm).